Radiant barrier plywood can easily be made yourself by simply stapling our Ultima-FOIL directly to the OSB or plywood decking during a new roof construction. Many building supply companies offer a plywood or OSB (oriented strand board) sheathing product with a radiant barrier already laminated to one side of the board. This radiant barrier plywood is generally used for new roofing applications with the reflective siding facing into the attic space. Felt and shingles are then applied over the top of the roof decking as usual. installation of the roof decking. However, purchasing these pre-laminated radiant barrier plywood products are very expensive. 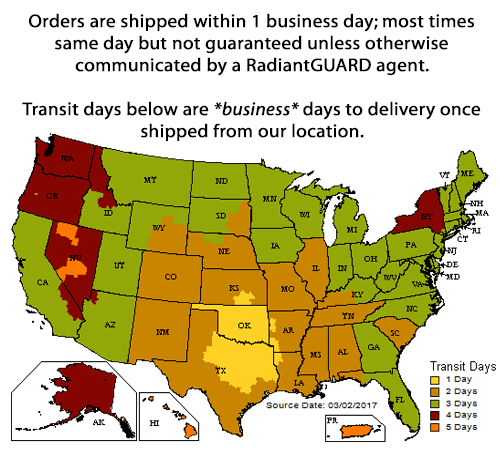 RadiantGUARD® Ultima-foil 48-inch width radiant barrier can easily be stapled to a sheet of plywood or OSB before being installed as roof decking. Radiant barrier roof decking can easily be made yourself by simply stapling our Ultima-FOIL directly to the OSB or plywood decking during a new roof construction. Of Higher Quality Tear and Puncture Resistance - Many radiant barrier sheathing manufacturers use a lightweight radiant barrier which can easily tear during transportation or while stored at a construction site. Breathable - Using our perforated radiant barriers in this application guarantees you the comfort in knowing that you have a "breathable" product. Some radiant barrier sheathing manufacturers have had issues in the past with the glue used during the lamination process "sealing" up perforations that may have existed in the barrier before the manufacturing process. It is important to have a breathable roof decking sheathing to allow the moisture that is generated within a residential home to pass to the outside reduce moisture buildup which could potentially result in mold and other damage to insulation and wood structures..
Less Costly - Applying the sheet radiant barrier to the plywood decking yourself is approximately 1/5 the cost of pre-laminated radiant barrier decking products on the market today. If you're in the market for a new roof, encourage the roofing company you hire to purchase our Ultima-FOIL radiant barrier and staple it to their plywood decking to create a less expensive radiant barrier osb and enjoy the benefits of a cooler attic while you enjoy the savings year round.